The high peaks of Kosciuszko National Park are a mecca for walkers keen to see rugged scenery, masses of spectacular wildflowers and the summit of Mt Kosciuszko, earning it the prestigious UNESCO Biosphere Reserve status. The walking is exhilarating yet relatively easy for an alpine environment. The rewards are considerable with spectacular views as you walk each day, mountain fresh air and the sense of completion as you wind your way through the mountains from Wragges Creek to Thredbo. These mountains were once covered by glaciers that carved exquisite lakes from the granite rock, as well as numerous steep sided valleys. Walk through snowgum woodlands, and colourful alpine meadows and sit enjoying lunch at Kosciusko, by beautiful creeks and the Blue Lake. 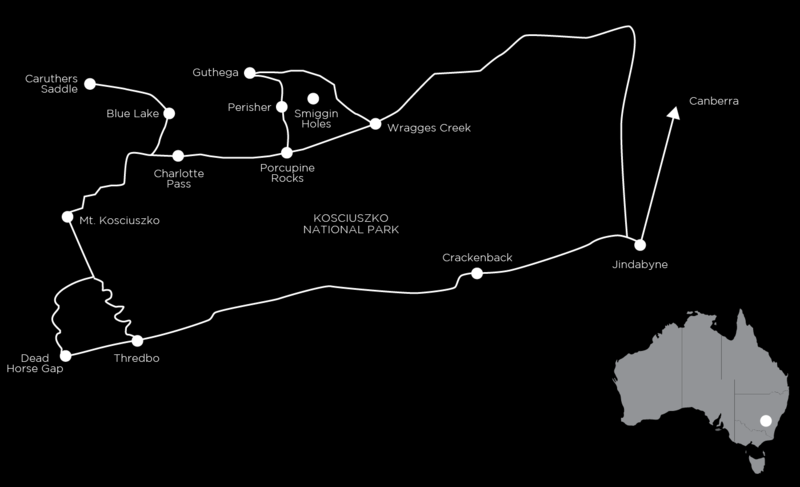 Follow the Aqueduct Trail, learning about the mighty Snowy Mountains Scheme and cross the Snowy River. On the last day, we take the chairlift ride back to the top of Mt Kosciuszko and walk down from the summit to Thredbo via Dead Horse Gap to cap off what is an amazing unbroken linear trek through the alps. If you’re after a shorter itinerary, then our 4-day Roof of Australia Long Weekend trip may suit you better. Every last detail is taken care of so you can fully immerse yourself in this extraordinary alpine landscape. At night freshen up and settle in at your comfortable accommodation. The two course dinners and cooked breakfasts make indulgent bookends to each day. And with two outstanding guides, you can pace yourself because we can offer a choice of easier or harder walking options along the way. Start at the Vibe Hotel at 9:30am, Canberra Airport at 9:40am or in Canberra CBD at 10am (on London Circuit out front of the museum). Travel to Jindabyne for lunch. Afternoon walk featuring a beautiful section of the Thredbo River, superb wildflowers and a historic hut. Meals: Continental buffet breakfast, lunch and two course dinner at the Lodge. Traverse through Blue Cow alpine ski resort to Perisher Valley. Climb to Porcupine Rocks for spectacular views of Crackenback. The ancient snowgum trees here are twisted and gnarled through centuries of harsh winters. After rain or fog these tree trunks change colour to brilliant shades of red, orange, yellow and green. In summer when we walk this track, the wildflowers have to be seen to be believed – fields of snow daisies, alpine buttercups, billy buttons, golden everlastings and unique alpine gentians. This is Man from Snowy River territory; step back in time and visit an historic cattleman’s hut. High above the tree line we’ll learn how delicate plants can thrive in such challenging conditions and gain an insight into the geology of this rugged landscape. Today we walk to Blue Lake, Headley Tarn and Caruthers Saddle. Cross the famous Snowy River, walk through fields carpeted in wildflowers, stroll along high grassy ridges and chill your drink in an icy lake. Watch out for Sphagnum Bogs – large mossy plants that hold six times their weight in water then slowly release it into the alpine streams. At lunch, we sit alongside the unique Feldmark plants that occur nowhere else on earth. Walk to the summit of the highest mountain in Australia, Mt Kosciuszko, a highlight not to be missed. This mountain is a mecca for walkers and you’ll share the summit with people from all over the world. Finish the day with an exhilarating ride down the country’s longest chairlift. Hardy walkers can choose to walk Merritt’s Track steeply down through unique Mountain Ash forests and waterfall valleys. Meals: Cooked breakfast, walkers lunch and two course chef prepared dinner at a local restaurant. Today’s your chance to take the easy way and ride the chairlift up. Our walk descends through fields of alpine wildflowers and snowgum forests to the Thredbo Valley. Will you be one of the lucky ones to see wild brumbies roaming the plains? Walk quietly in this special, pristine place. Finish the day with an easy stroll along the banks of the swift Thredbo River as it meanders down to the village. After breakfast, we’ll tour back to Canberra airport where the trip finishes at around 1.00pm. The tracks are well graded except for one small portion on Day 3, but all the tracks are still easy to negotiate. Full day walks average about 15km. There are great opportunities for really fit walkers to challenge themselves on most days. We stay in high quality ski lodges right in the middle of the park, thus the accommodations are all in memorable locations. More importantly they are very comfortable and provide a great place to relax after a day on the track. All the rooms have ensuites and reflect the alpine regions’ character. The two course dinners are prepared by professional chefs at Boali and in Jindabyne while the others are expertly prepared by our guides, with the added advantage of welcome drinks on those nights. The area is noted for fresh Snowy Mountains trout and tender high-country beef, and also boasts the highest winery in the country. Packed walkers lunches and picnics complete the circle ensuring that your appetite is always satisfied. In fact, you can look forward to having lunch on a daily basis at some of the most beautiful alpine locations in Australia. A walkers lunch may include a high protein type salad, a roll or a wrap, a muesli bar, cake or muffin and a piece of fruit. Each day is slightly different. Lunch is always augmented by Auswalk’s trail mix. Importantly, you start each day with a cooked breakfast – a great way to ready yourself for the upcoming walk. The tracks are mostly well cared for, dry and firm this time of year. However, on the odd occasion we have encountered wet portions of track. Most of the walks are moderate. The easier alternative walks are great for first timers. However, the walks often involve challenging walking between 5 to 7 hours each day, across amazing ridgelines, with some steep ascents and descents so the experienced hikers won’t be disappointed. The altitude on this walk is between 1400 to 2228 metres so slopes that you would find easy at home will require a little more effort, This trip operates with two experienced and knowledgeable guides, so we can offer easier and harder walk options along the way. Pre and post tour accommodation: There are many good hotels in Canberra, however we pick up and drop off at the Vibe Hotel at Canberra Airport and the airport. The tour starts at the Vibe Hotel at 9.30am, Canberra airport at 9.40am or in Canberra CBD at 10am (on London Circuit out front of the museum). The tour finishes in Canberra on the last day at approximately 1pm. This mountain environment is about 10 degrees cooler than Sydney. January-February is usually warm and the alpine wildflowers are at their best. December & March are usually cool to mild. By April, the conditions usually start to deteriorate. This holiday is not available for the rest of the year due to the likelihood of snow covering the walking tracks.